The eastern hellbender has declined across much of its range and is a candidate for listing under the Endangered Species Act. Some of the most viable remaining populations exist in the Southern Appalachian Region in the Tennessee Valley watershed; however these populations are highly isolated and fragmented, and occupy several physiographic provinces, suggesting they may exhibit significant levels of genetic differentiation. We investigated genetic and phylogeographic relationships among eastern hellbender populations across the Tennessee Valley, using nuclear microsatellite markers and mitochondrial sequence data. Our population genetic analyses of microsatellite data revealed a strong pattern of isolation by stream distance, and 4 genetically distinct populations. These four populations were mainly associated with major watersheds, although middle Tennessee samples were difficult to assign to any particular population. Our phylogeographic analysis of mtDNA resulted in a strongly supported monophyletic ingroup containing nine largely allopatric clades, which also largely corresponded to major watersheds. 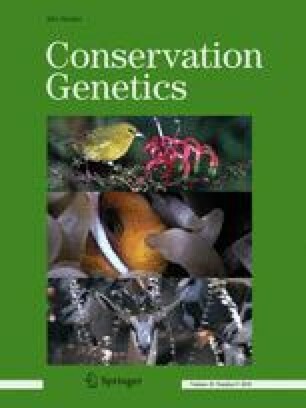 Our findings suggest that hellbenders from different watersheds in the Tennessee Valley should be recognized as genetically distinct populations, and care should be taken to balance the needs of rescuing declining populations with translocation or headstart programs, while also preserving genetic diversity across the region. The online version of this article ( https://doi.org/10.1007/s10592-017-1033-8) contains supplementary material, which is available to authorized users. We thank the many individuals who assisted in conducting fieldwork, including Lee University undergraduate students, D. Hedrick (Chattanooga Zoo), and J. Herrig (USDA National Forest Service). We also thank the following funding sources: Tennessee Wildlife Resource Agency, USDA Forest Service, Appalachian College Association, Lee University, Indiana Department of Natural Resources, University of Tennessee at Chattanooga, Purdue University, Cryptobranchid Interest Group Ron Goellner Fund.